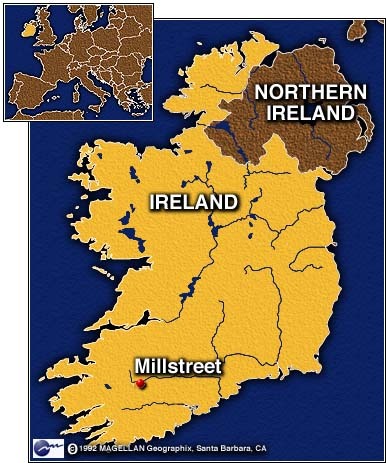 MILLSTREET, Ireland (CNN) -- Ireland is preparing for what promises to be a very close national election on Friday. But this weekend, the country put political rivalries aside and joined in commemorating a tragedy from Ireland's past. A festival observing the 150th anniversary of the Great Potato Famine in Ireland began this weekend, opening with a ceremony at Ireland's Drishane Castle. Irish President Mary Robinson lit the first of many candles to commemorate the famine victims, and the Irish folk group The Chieftans kicked off the music and dancing. "It is my great honor to light a candle for this great event and wish you well for the remainder of the evening," Robinson said. In the 1840s, a mostly Protestant British aristocracy ruled over a mostly poor Irish Catholic population. The latter group was growing at an alarming rate, and relied almost completely on one staple for its survival: the potato. Potato blight, which struck first in 1845 and was at its worst in 1847, destroyed the crop and left millions starving. British government policy at the time made grain available but at prices most could not afford. 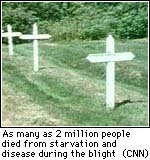 As many as 2 million died from starvation and disease as crops failed again and again. Severe winter weather also took its toll. Desperate to survive, hundreds of thousands crowded into ports to head for the New World. Those that did make it to America, Canada or Australia in the 1840s often faced conditions not much better than those they had left. And many who boarded ships did not survive the voyage. The U.S. government at the time refused any official aid for Ireland. Congress rushed through laws to try to curtail the influx of poor Irish to America's cities. Money and food aid from Irish already in the U.S. did, however, flow back to Ireland, and the money kept coming for many years. Much of it went to pay the price of a ship's passage for friends and relatives. 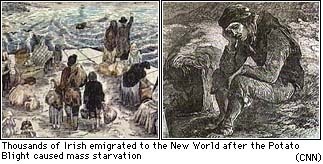 Ireland now gives more per capita to famine relief around the world than any other country, a reflection perhaps of the deep sense of pain that the famine of "Black '47" has left in Ireland's culture. The event this weekend acknowledges the victims of the famine as well as those who stayed in Ireland to help make it one of today's most successful European economies. It is also a homecoming for the descendants of those who left and helped to build countries in every corner of the world. Almost 80 million people around the world claim to be of Irish descent. CNN's David Clinch contributed to this report.